Regular maintenance of your leather REVIT! motorcycle garment optimizes its performance and guarantees long life. With REVIT! 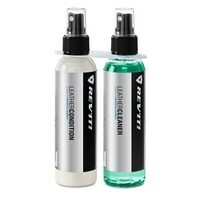 LEATHER CLEANER you can thoroughly clean all sorts of leather. Use REVIT! LEATHER CONDITIONER afterwards to protect and feed all smooth leather garments. It will help preserve the water- and dirt-resistant qualities of leather, as well as the special leather smell. For best results we advise treating your garment with leather cleaner and conditioner at least twice a year.